Last week, I posted my recipe for Collard Wraps, a delicious and healthy portable lunch. But I have to admit ~ as much as I LOVE my greens (and I really do), sometimes I want something… fluffier. Bread-ier. More “traditional.” Carb-ish. We’ve been staying away from wheat and flour around here, for various reasons, and I certainly feel excellent as a result. However! I do occasionally miss a sandwich or burrito. 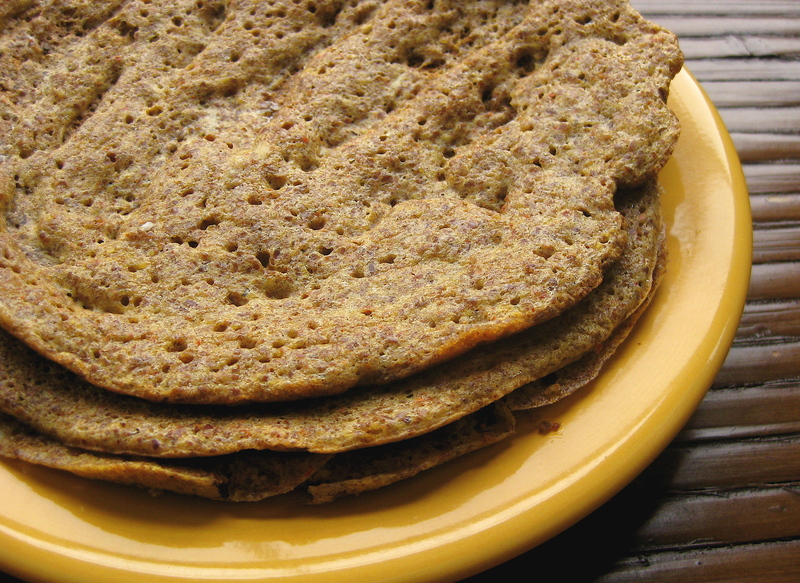 Well, to my excitement, I discovered this recipe for super-easy wraps made with flaxseed meal, that are the perfect stand-in for a tortilla, pita, or bread. The recipe came from the book Wheat Belly, a very interesting book about the development of modern wheat and why it causes so many problems for so many people. The wrap is fluffy, like a pita, but malleable, like a tortilla. So, if you want something less “green” but still super-healthy, you can follow my recipe for Collard Wraps but use these, instead! I’ve found these wraps to be an excellent alternative to any carb-o-licious, flour-based foods I might be craving. They are also delicious when spread with almond butter or cream cheese! If you make these, I’d love to hear what you spread and/or filled them with, or if you tried an alternative recipe! Do you ever stay away from wheat and/or flour? If so, do you have any favorite alternatives to bread, pitas, and tortillas? I too am on the GF train and wondered about these wraps. Thanks for road testing them!! How was the cheesecake? I loved that book but some of the food suggestions seemed so 90’s. The flax wrap looked the best. The cheesecake was pretty good. I made it with an almond crust and that turned out well. TBH, though, I’ve made dozens of cheesecakes in my life and this wasn’t #1, but definitely not bad. I’m happy with the almond crust, though! Yeah, sometimes recipes are a win for just one component, an almond crust for example. Good to know, thanks again for reviewing these. I was so curious! Can you freeze the wheat belly breads? I’m not sure; I’ve never done so. I believe an earlier commenter said it was possible, but I personally have never frozen this wrap. Hello, tried the receipes, but my wrap broke when I was rolling it into. Wrap. Where Did I go wrong? That’s a great question. I have no idea how well they’d freeze. I do know that when I made a few and stored them in a Ziplock, they got a little soggy. But that’s no indication how well they’d freeze. It’s so nice to have a YUMmy toast alternative! I added 1 tsp of almond meal and then baked them in a warm oven for 1 hour, on the lowest setting, it dries them out nicely so they taste more substantial and less floppy. They kept in my fridge for a week and a half till I ate them all up. I have been looking for a way to make simple delicious gf wraps for at least 2 years. These are amazing and hold together so well. Thanks! I cooked them in the pan first and then in the warm oven. Sorry for the confusion! Iv made paleo breads before which had flaxseed in and was able to successfully freeze them, im pretty sure you can freeze these too i dont why you could’nt. just thought i’d help. Never head of the sourdough loaf. Where do you get it.? I totally want to make these!!! They look great! Cool! Would love to hear if you try ’em 🙂 Thanks for stopping by! These amounts make one wrap? Hi! I made these today but they taste like egg omelette and break easily 😦 Plus, it doesn’t spread easily. Not sure. Try coconut oil next time! I made these today with olive oil as I didn’t have any coconut oil and i made them in my nonstick fry pan like a pancake. The first one broke as I tried to turn it too soon. I let the second one cook for longer on low with the lid on and it turned out perfect. I’m not a fan of microwave cooking so if anyone is looking to use a fry pan, it works!! I’m just wondering if 3TBSP of flax is not too much as a daily consumption? I read somewhere that you should start with one TBSP and build it up to 2 per day as it can cause constipation….. too much fibre maybe. Any insight on this? Drink lots of water with it but fiber does not cause constipation. A lot of it can be uncomfortable though so lubricate it with plenty of water. I’m just about to order a Tortilla press and use it for this recipe. My husband likes the low card ones he orders from a supermarket online, they work out expensive with postage so as I make my own bread I’ll try this recipe. and let you know how it turns out. Are you using a tortilla press or a “tortilla maker” (i.e. something that just forms them, or something that forms and cooks them)? I’ll be using a press that just forms them. Haven’t got round to ordering one yet though. I like these but achieving the right consistency takes practice. I took away 1 Tbsp of Flaxseed and replaced it with Almond Flour which is fluffier and adds a nice flavor/texture counter to the flaxseed. Also, you can add some vanilla to add some sweetness without loading up the sugar. Just 1/2 tsp is enough to offset the graininess of the flax without making it taste like a sweet food. I’m not sure, since I’ve never tried sweetening them. You could try a few drops of liquid stevia — that would be low-carb and not artificial. I mixed a couple of wraps this evening using modifications posted earlier by others. One tablespoon of flaxseed meal was swapped for one tbsp of almond flour, and the water was increased to 1/8 cup. The microwave had been cooking them well, before, but they were ending up crisp – still quite delicious, just crisp. This time I used a skillet and ended up with two fluffy (and foldable) wraps. A few more of those this weekend might be made into pancakes. The key to this I think is double the water at least, maybe sub out the almond flour though I didn’t because of nut allergies, and cook it LOW. I had my burner between 2 and 3. and I flipped mine. I also spread it out and worked with it until it was evenly dispersed with a spatula. But doing all of the above, mine turned out great. Also, I subbed butter and olive oil for coconut oil so not sure that was the problem. and added a touch of raw honey for sweetness. They are flexible and delicious. What is the purpose of the paprika? It doesn’t have any taste as far as I know. Thanks! Looking forward to trying these this weekend. It’s to add flavor 🙂 If you think paprika has no taste, try Hungarian paprika! I made these, only I could not get the batter to spread out evenly in my hot pan.I used the coco oil too. I just ate it with a fork, turkey, avocado, salsa, cheese slightly melted in the microwave. HOW to you get it perfectly round..or do they just come out a bit thicker like pancakes? I made flakseed bread, its like focaccia or flat bread. fabulous. This was great! If someone is looking for a lower calories version I subbed the tablespoon of coconut oil (120 calories) with a tablespoon of canned pumpkin puree (7 calories). It didn’t make it taste like pumpkin and it held together amazingly!! I did put a very small amount of olive oil in the pie pan before I poured the batter to prevent sticking. Seriously easiest and tastiest wrap I’ve had. Even my non gf boyfriend approved. Oh yeah and I used the pie pan/microwave version from the original recipe and it took about 4 mins. My microwave always takes longer. Will try in the skillet next time but this was so easy. My husband is diabetic. I am making fish tacos for dinner so instead of using the regular wraps that are full of bad carbs I am making these instead.. I made this for breakfast in a cast iron frying pan, then spread almond butter then added a sprinkle of cinnamon and sliced bananas and ate it like a quesadilla. Delish! Thank-you SOOOOO much for posting this, hon! Does this make only one tortilla? Check out these flaxseed wraps! I love this! Thank you Andrea Drugay! Thrilled thrilled thrilled to find this recipe!! We are eating mostly raw , and quite truthfully I’m missing my bread LOL , this is so easy to make up and it came out great! I made it per the recipe , without increasing water or anything , it was really good. Thanks so much for posting this! Awesome! I’m happy it worked well for you! I simply pour the batter into a medium sized plate and cook them in the microwave for 2 minutes. Turns out great every time. Try this with roasted sesame seeds. Awesome!!! Cool! 😀 Thanks for your comment! I’ve been eating these wraps for some time (the recipe was in “Wheat Belly” by Dr. William Davis). Finding the texture to be too “flaxy,” I use two tablespoons of teff flour and one tablespoon of flax meal. Also, lately I’ve been omitting the baking powder and the wraps are just fine without it. Oh – and I always have to add more water than the recipe calls for. I love these! Thanks for posting this recipe. Oh – and I, too, use a cast-iron skillet. I won’t have a microwave in my house. 🙂 I sometimes make several small ones, like pancakes, instead of one big wrap. I haven’t tried batch-making ahead of time, but they might get soggy, like pancakes. Thanks so much! I can’t wait to try this recipe. I’m on a LCHF diet. I’ve never seen a wrap recipe with linseed. Thanks again! Really enjoyed the wraps. I did struggle to spread the mixture racing with the the glutty nature if the wetted meal. I also like to make buns with ground nuts and seeds and flax, egg, coconut oil and a little bicarb. I’m watching sugar but these are great with fruit in the mix and baked as usual. Is there a way to make them without the egg? (I’m allergic) I usually use flax/water for an egg. Since it already has flax I am thinking it might not work without an actual “egg”. Any ideas?